More codes & capabilities than other OBDII scan tools in its class. 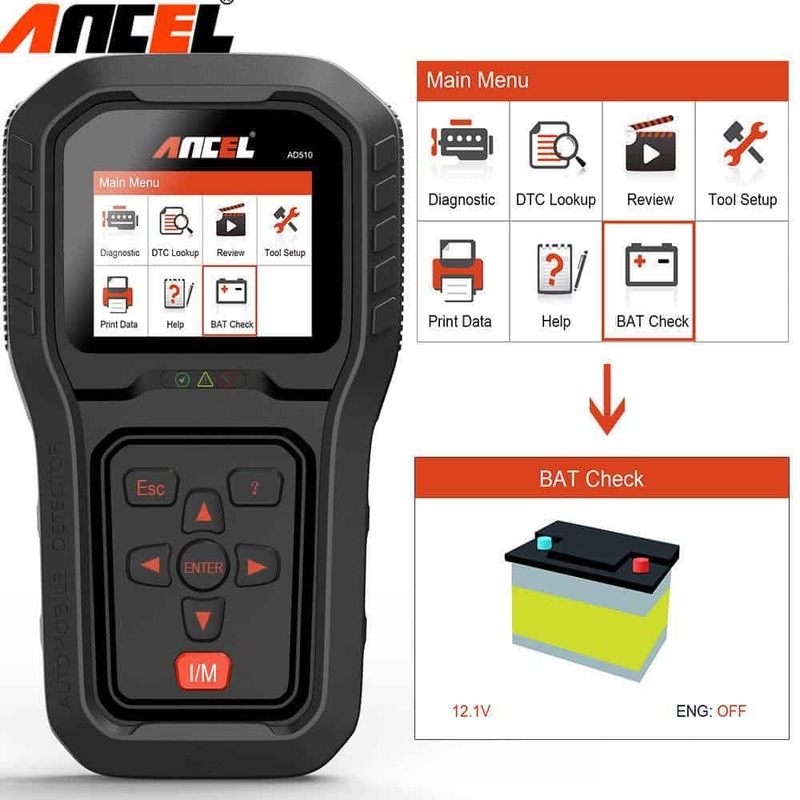 The Ancel AD510 is a powerful scan tool for not much money. It’s a great shop companion for the professional technician and the DIY mechanic tinkering in their garage. The features, compatibility, and connectivity make this one of the best values on the market in terms of getting more for your money, too. Check out our review to see if the Ancel AD510 is a good fit for you. Any tool you need to get out and put away on a regular basis needs to be compact and comfortable to carry around your garage or shop in your hip pocket or coveralls pockets. The AD510 definitely meets this requirement. The matte plastic and grip panels make keeping a hold on it easy when you are pulling trouble codes on a vehicle, and all buttons are easy to use in the cold or when you’ve got work gloves on. It’s also lightweight, so you don't feel like weighed down if you do need to keep it on your tool belt or pocket. As far as hooking it up to an OBDII port, this has a brightly colored port plug and plenty of cable length so you can take real time readings and freeze frame engine data when diagnosing an unknown issue triggering multiple trouble codes. The AD510 also powers off your car’s electrical system, so there’s no need to keep it charged or keep batteries handy when it's in use. The back-lit screen also makes it easy to read even if you don’t have a work light handy to see the display like with old monochrome LCD displays. If you live and work in the US or Canada, this device is preprogrammed with the trouble codes for all cars sold in North America after 1996. Got a car in your shop or home garage that doesn’t come up? Connect your AD510 to a PC with an internet connection, and you’re good to go. You can both print reports from vehicle scans and update the trouble code database on your AD510 in just a few minutes. The AD510 can read and reset most onboard electronic control systems, but it is not designed to act as a programming interface for your Automatic Braking System or Electronic Suspension settings. Most handheld scan tools do not offer this feature, and a more advanced computer tablet style scanner is needed to adjust or program onboard electronic controls. Need an accurate picture of the cars engine systems and how they are presently functioning to explain what’s wrong to your customer? Hook your AD510 up to the car, turn it on and start a real time scan. Hit the Freeze Frame button to capture the live stream, and then connect your AD510 to your Windows computer to print the Freeze Frame out. It’s also useful for keeping maintenance records on a vehicle with an ongoing issue that you just can’t seem to fix. The small footprint and durable build quality are major selling points for professional mechanics who need their scan tool to survive the multitude of on the job accidents and drops that happen many times per day. The ability to keep your scan tool in your pocket or coveralls cuts down on trips to the tool bench, and it makes it easy to get a clear picture of what is potentially wrong with a car as soon as it rolls into your shop. For DIY mechanics, it’s also a great choice thanks to its budget friendly cost, high quality of build, and no need for costly extras if you just need to pull trouble codes on one or two cards to keep up with your own vehicle maintenance. Wireless connectivity via WiFi or Bluetooth is commonplace among smartphones and tablets and smart home accessories that cost less and have more processing power than the AD510. 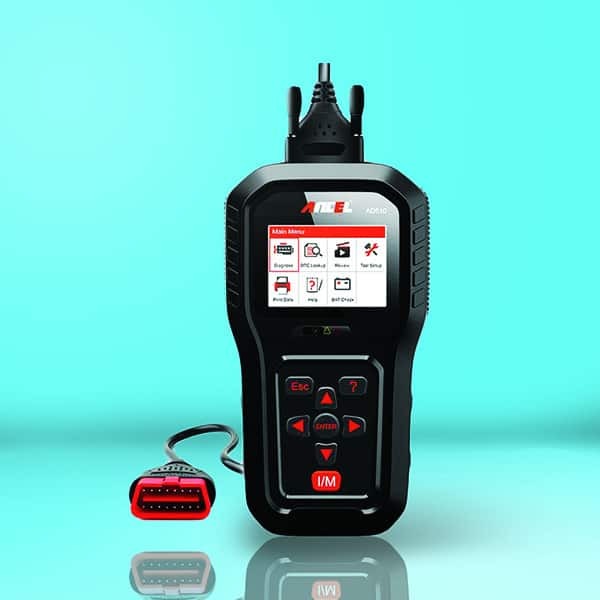 While it’s not necessary for every DIY mechanic or shop technician, it would definitely improve the capabilities and flexibility of a handheld scan tool. With wireless, you could just plug in a port transmitter and check the readings on your scan tool as long as you are nearby. OBDII scanners with these features are generally prohibitively expensive, and it would make this a more attractive option if you never needed to plug it in via OBDII multi-pin connection or USB. Need the most bang for less buck? Check out the AD510. It’s got a few drawbacks, but the benefits and capabilities still make it an excellent choice for professionals and home DIY mechanics alike. Check one out for yourself, we guarantee you’ll love it regardless of what scanning tasks you need it for.